Patient JL was referred to me via the refractive surgery center. He was diagnosed with keratoconus approximately fifteen years prior while undergoing a LASIK evaluation. He had undergone corneal collagen cross-linking in both eyes in April, 2014. He presented wearing soft toric contact lenses which resulted in 20/20 vision OD but 20/50 vision OS. The vision through the left contact lens was highly variable due to lens centration issues. After discussing the various options that exist, it was decided that the patient was a good candidate for the UltraHealth FC lens. The fitting is nearly identical to that of the traditional UltraHealth lens. I have found that the reverse geometry design of the lens coupled with the flatter central vaults have resulted in improved patient comfort in many instances. The lens behaves in a repeatable and predictable manner, thus resulting in a smooth and easy process for the patient and practitioner. 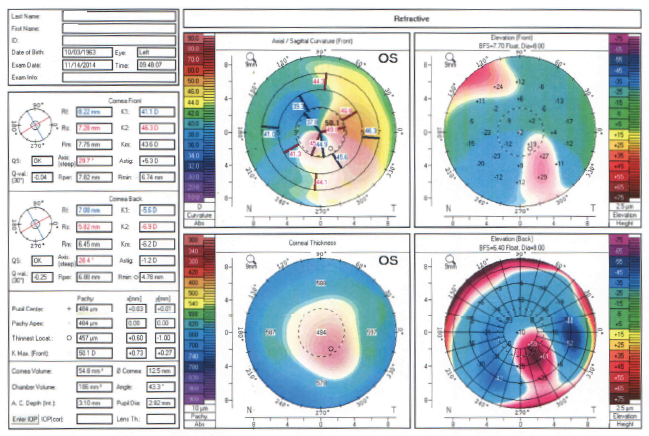 The UltraHealth FC lens will provide the practitioner yet another tool to better care for those with uniquely flat central corneal curvature values as compared to the corneal periphery. The FC lenses will allow for better alignment with the corneal surface, thus allowing for improved optics, better lens centration, and improved tear exchange. As with every specialty lens on the market, a subset of patients exists that may fall outside the abilities of the UltraHealth FC lens. However, this lens with its predictable and reliable fitting allows the eye care provider to offer the benefits of a hybrid lens to more patients than ever before.